The V&A was the second place that we shared our prototype version of Movement Alphabet, an installation and live participatory experience for audience to make their marks and get their own algorithmically generated ‘movement portrait’ taken. It was a surreal and exciting context to work, in amongst Renaissance paintings originally painted for the Pope in the 1500s… We landed like nomads, pitching up our ‘pod’, making the Raphael Gallery our home for the next 3 hours and building a comfy and inviting space for passersby to join us. Neus Gil Cortes, our dramaturg, joined myself and Tim Murray-Browne in creating this intimate space, setting around us neon lights, tatami mats, a curtain, translucent screens and homely decorations around the stone floor. We laid out portraits of past participants. In the last month I was working with test participants, researching with them in the studio alongside the kinect camera, helping them unravel stories and dreams coming out of play and imagination through movement and conversation. Now, with the support of my collaborator Tim Murray-Browne, our dramaturg Neus and mentors Jade and Jorge from ZU-UK Theatre, I have been able to work on this challenge of designing and facilitating a streamlined version of the experience: a swift 10 minutes of guided one-to-one participation, allowing more visitors to experience the immersive participatory element of the piece. It’s been a big learning curve but one that has opened my eyes (and body and mind!) to the subtleties of connection and honed my improvisation skills: shown ways to bring me closer to a deeper connection with the audience member, how to craft my words and physical energy to create space for them to let go and open up, feel at ease to say, move and share what is meaningful for them in those moments. It was apt that the V&A was immersed in stone; the floor, the walls, surrounded by sculptured figures. I told each participant a story evoking cave walls, the rocky curved surfaces that might look like a face under the flickering lights of a communal fire, years and years ago in history. Each time I met an audience member, I felt some magic to be able to hold that space for them, tapping into a long stretch of time into the past, connecting us contemporary humans to those who made the marks of the first cave paintings. See the full blogpost of Melanie Lenz (curator of Digital Drop-in @ Victoria & Albert Museum) on her experience in Movement Alphabet. 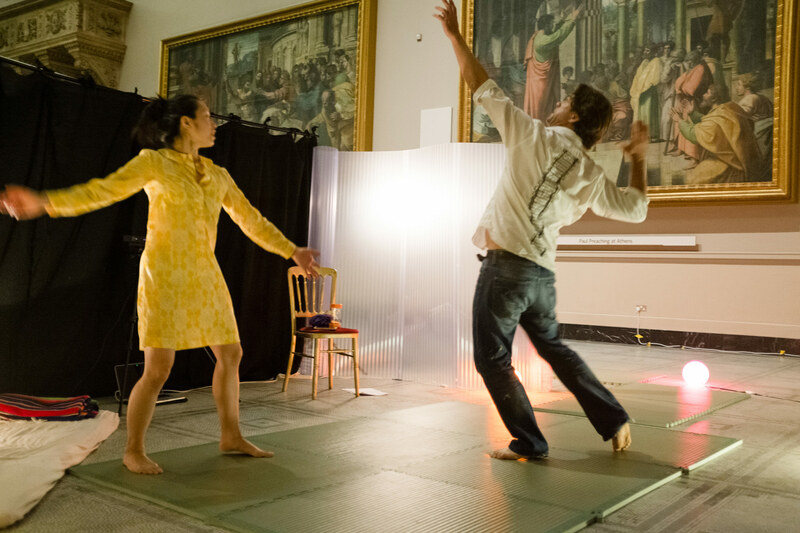 Jan Lee with participant Patricio Forrester at the Victoria & Albert Museum, 16 July 2016. Jan Lee, 6 September 2016. Yacine, Rosie, Shannon, John, Lavinia, Carlo, Greg, Hanzo, Camila, Petra, Jorge, Jade, Kayja, Tadeo, Sara, Sara, Esther, Danai, Chiara, Thelma, Monika, Neus, Trisha, Yong, Esther, Ciarán, Kieran, Nadine, Borja, Catherine, Kay, Mayan, Mischa, Tom, Daniel, HyeJeong, Chloë, Carrie and Mai.